My fascination with photography started when I was a sophomore in high school. I took my first b/w photography course with Sandra Truant (I thought it was so cool we shared the same first name:) and I was totally hooked. I can remember the first time I watched a photograph appear in a pan of developer in the darkroom. I couldn't wait to get in there and create my own magic. I got my first enlarger when I was a junior and set up a darkroom in the boiler room of my parent's basement. It was totally dangerous and not light proof but I was determined. It wasn't until I was in college and could make my own hours that I would spend entire days in the darkroom printing and perfecting my images. 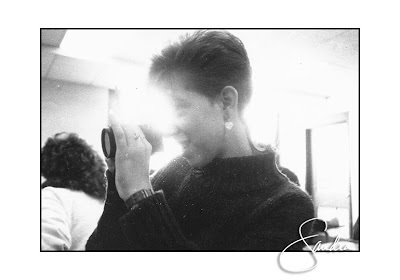 The photo above is dated September 1986 and was taken by someone on the yearbook staff at my high school. I was sixteen years old. I had a very cool haircut with a rat's tail (can you see it trailing behind my head) which was very hip at the time. I carried a Pentex ME Super and two prime lenses, 50mm and 28mm, both 2.8. Not bad. I still have the camera and have been thinking about pulling it out and taking some photos just for the heck of it. If I do I'll be sure to post some of the images. Thanks to my Aunt Mamie for finding this photo and passing it along. ha! The rat tail! I remember them!!! I love the old photo! I love the stories about how you became the totally awesome stick of dynamite that you are today!!! Rock on, sistah! I remember all of it! Especially the rat tail and boiler room/dark room... I think about that space every time I go into your parent's house. The birth of an artist can take place in some unusual places!! The rat tail, Mush! I love it! I'm so glad Mamie dug up this photo! !